"Mrs. D.H. Seaver was drowned here last evening while rescuing her child. The boy, aged 6, fell into a little stream swollen by high water. The mother dashed into the stream and caught the child, but was swept down by the strong current and carried beneath a bridge. Mr. Seaver ran to the creek and dragged his wife from the water. The child was tightly clasped in her arms and was quickly revived, but Mrs. Seaver never recovered consciousness." 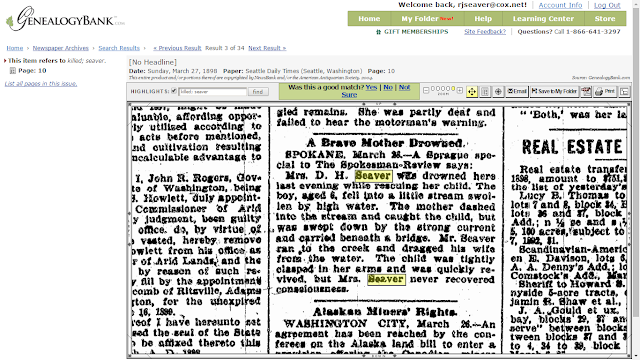 "A Brave Mother Drowned" Seattle [Wash.] Daily Times, online index and digital image, GenealogyBank (http://www.genealogybank.com), Sunday, 27 March 1899, page 10, column 4, Mrs. D.H. Seaver death article. Do I have D.H. Seaver in my RootsMagic database? What was Mrs. Seaver's name? Also, which child was swept away? I looked through the Seaver folks in my database with D given names, quickly found Daniel Horace Seaver (1848-1924), whose wife was Mary Ellen Snyder (1867-1898). I had a death date for Mary Ellen Snyder Seaver from Find A Grave as 24 March 1898. So that is probably her. Daniel and Mary (Snyder) Seaver had 7 children between 1887 and 1896. The boy who was nearest age 6 was George Lyman Seaver (1893-1963). There are thousands of stories in the historical newspapers about Seaver persons. This has been one of them. A family tragedy to be sure - seven young children left motherless by a careless step, a brave who mother jumped in the water to save her child, and lost her life, in the blink of an eye almost. The child was old enough to remember this episode in his life. Sad.